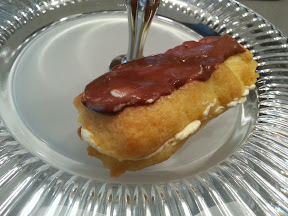 Shira tried out a new recipe this evening: home made eclairs! I'm a big fan of all things cream filled, and her recipie didn't disappoint. Seriously, I snuck one before dinner and it was heavenly. Shira's advice for a happy marriage: know her favorite jewelry, and his favorite dessert(s) and make then both appear every so often, just because.